Smart design features and an optimized interior make this a true builder’s PC case. That’s because we believe building a system should be straightforward, trouble-free, and even fun. Corsair Obsidian Series cases are designed by system builders, for system builders, for the sole purpose of building truly extraordinary PCs. Rugged steel meets the subtle elegance of brushed aluminum in these world-class PC cases designed to be the foundations of amazing systems. The custom engineered 750D case delivers excellent airflow with less turbulence and noise. The 2 front intake fans allow cold air to pass through the case and cool your components, while the 140mm exhaust fan extracts all of the warm air for a cooler case. Great airflow doesnft have to be noisy. The fans can push good amounts of air across your hottest devices with less distracting fan hum, and the direct airflow design of the 750D provides an excellent path for cold air to get to your hottest parts. This case comes with 3 fans included, at the front it hosts two 140mm AF140L fan and at the rear is a single 140mm AF140L fan. 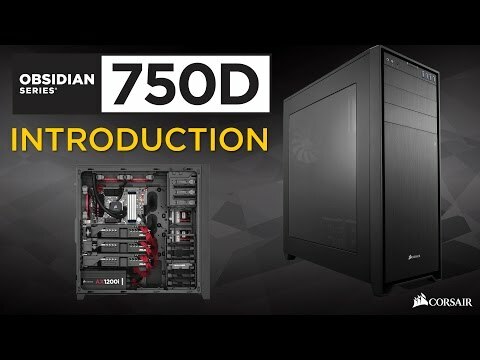 The 750D has room at the front, top, and rear for radiators, allowing you to quiet down your GPU and CPU with liquid coolers, this also allows you to get better overclocks out of your components for better quality gaming. Corsair Obsidian 750D Black Full Tower case Aluminium Steel with Side Window 3x140mm Fans USB 3.0 E-ATX/ATX w/o PSU is rated 4.6 out of 5 by 31. Rated 5 out of 5 by G1XTR from Quality Item, Very Pleased! I couldn't be happier! The case was delivered within 24hrs and for £4.00. The Box the case was deliverd in was in good condition all the kit parts where inside neatly packed. The computer build went perfectly and I have to say it's is the best case I've ever owned. The case fans that come in the kit are smooth and very quiet running. Rated 4 out of 5 by Johnothan from Everything one can expect I cannot think of one thing which disappointed me about this case. Great air flow and very quiet with a simplistic and functional layout. Rated 5 out of 5 by blady from best value for money Just love this case lots of space inside u can easy install long gpu like 13inch zotac 980ti and still have space. Cable management is on high standard. Overall worth every penny. Rated 5 out of 5 by Saffi from Fantastic case I couldn't be more pleased with this case. It is a joy to work with. Cable management is fantastic. Temps have dropped 15 degrees from what they were in my old case. Rated 5 out of 5 by Mattiij from Looks great but big! This case is fantastic so much room inside room for multiple hard drives 2 graphics card water cooler anything you want basically fantastic purchase. Rated 5 out of 5 by iEddiez94 from Corsair build, Corsair quality You cant have a bad Corsair case. The no tool designs are amazing and really help with the build. So many tie downs and grommets to hit zip ties and secure cables. Rated 5 out of 5 by fr33b5 from Exactly as described Corsair's 750D is exactly the big case it's described as. Plenty of room inside for whatever you've got to put in there. Some fiddlesome clips to remove front panels for DVD drives and such like. One missing feature, which I don't require (hence the 5 stars awarded) is a HDD hotswapable bay. Fans are whisper quiet too! What connector do the included fans have? Triple rad in the top?? Will a triple rad fit in the top of this case?? More so a Thermalchill PA120.3 rad... I'm trying to find something that will house my EVGA 759 and 762 boards.. I was hoping this one might get them in!! Will you stock the Corsair Obsidian series 750D High Airflow Intake kit?